A preliminary version of the plan calls for limiting motor vehicle traffic on Grand Street so space-efficient buses and bikes will be attractive options. DOT is considering an overhaul of Grand Street to speed up bus service and make bicycling safer during the impending L train shutdown. The agency’s preliminary plan, presented last night, calls for private car traffic to be diverted away from Grand in order to prioritize buses, bikes, and local deliveries. Grand Street during the L train shutdown presents a four-sided challenge: A large number of people will need speedy and efficient shuttle bus service connecting to the Williamsburg Bridge; it’s a high-volume bike connection to the bridge with a recent track record of fatal crashes; local delivery access has to be preserved; and through truck traffic will need alternate routes. At a workshop last night in East Williamsburg, DOT reps showed how the agency plans to make that work. It was the first of four open houses about the L train shutdown coming up in the weeks ahead. In DOT’s plan, motor vehicle through traffic would be diverted away from the section of Grand Street between Morgan Avenue and bridge. Westbound trucks and cars would be expected to take Metropolitan Avenue, and eastbound traffic from the bridge could be rerouted via “a variety of options,” according to DOT. This would clear the moving lanes for shuttle buses, which would come every two minutes during peak periods, though DOT is still being fuzzy about the hours that transit priority would remain in effect. Bike lanes would be shifted from the current door-zone configuration to the curb. The eastbound bike lane would be separated from traffic by a narrow painted buffer and a parking lane, while the westbound bike lane would receive a wide painted buffer but no physical protection. Without a physical barrier, the bike lane would still be vulnerable to incursions by illegal parkers and delivery vehicles. DOT said last night that details about bike lane protection have yet to be determined, according to Ohlson. 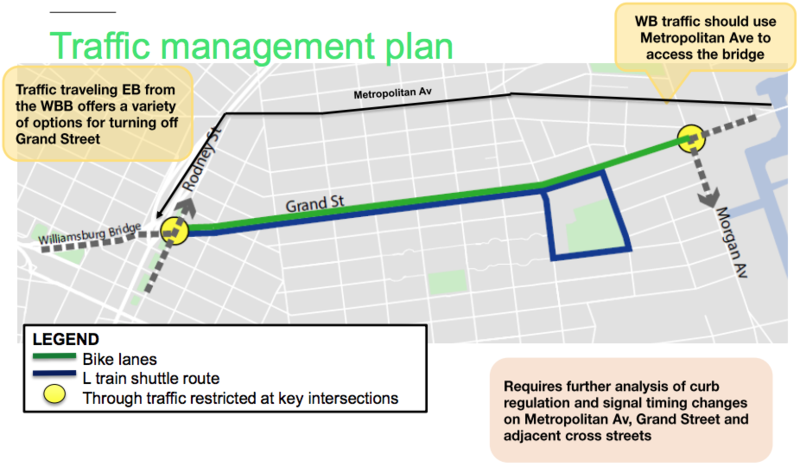 DOT also plans to add bike connections to Grand Street, including unprotected bike lanes on Devoe Street and Union Avenue, and buffered bike lanes on Morgan Avenue. TransAlt and Council Member Antonio Reynoso have campaigned for a Grand Street design that reduces car traffic and carves out space for transit and biking. Reynoso and Brooklyn Community Board 1 requested protected bike lanes on Grand Street in 2016, after the hit-and-run death of cyclist Matthew von Ohlen that summer. Von Ohlen was one of four people killed on Grand Street since 2010, according to DOT.